The sun is going to expand into the orbit of Mercury according to scientific calculations, which will result in the entire Earth catching on fire, terminating all life on the planet. In order to survive, the United Earth Government installs about 10,000 giant engines on Earth to propel it away from its initial orbit and flee to Alpha Centauri about 4.2 light years away. The whole trip is expected to last 2,500 years, during which time humankind will go through about 100 generations. Yet, as Earth approaches Jupiter, the gas giant's huge gravitational force captures the planet and threatens to tear Earth apart within days. Who will save the world? This imaginative tale is at the heart of the science-fiction movie The Wandering Earth, which premiered on Feb 5. The original novel was written by Liu Cixin, one of China's most prominent science-fiction writers and a recipient of the Hugo Award in 2015 for his novel The Three-Body Problem. 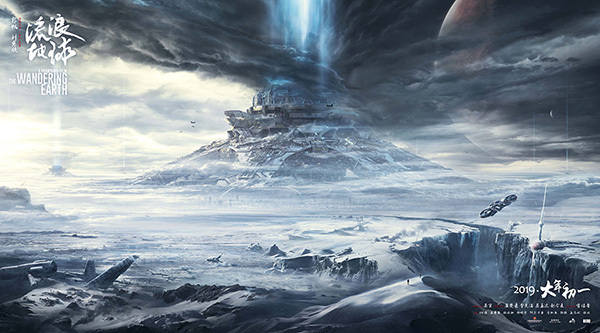 Perhaps thanks to Liu's fame, as well as the huge marketing efforts of the movie team, The Wandering Earth posted ticket sales of 670 million yuan ($99.3 million) on the first day of its release. That put it in fourth place at the box office that day, but its audience ratings on Douban, China's equivalent to IMDb, are as high as 8.4 points, surpassing all of the three other more profitable films. More importantly, The Wandering Earth is the first "made in China" science-fiction movie on the big screen, as the original novel was written by a Chinese author and the director, Guo Fan, is also Chinese. As a 10-year fan of Liu, having read almost all of his science-fiction books, I should mention the movie follows a rather different narrative from his novel. Actually, it only borrows from the novel the idea of the Earth having to flee the solar system, with humankind propelling it with over 10,000 engines. Those familiar with Liu's works might even find that one part of the movie, in which an astronaut sacrifices himself by driving the space station to the atmosphere of Jupiter, seems similar to the best part of another science-fiction story from Liu. That's just the point. It means domestic movie production teams have matured enough to develop new ideas on the creative basis of science-fiction writers, while the writers are willing to work together with movie productions so that the film results in the best possible performance. Liu may be a highly regarded science-fiction writer in China, but he is not the only one. There are many more writers with rich imaginations, and their works can be adapted into movies as well. Among movie commentators, a popular quote has emerged, forecasting that 2019 marks the starting year of prosperity for Chinese science-fiction movies because of The Wandering Earth. Only time will tell whether that prediction will come true. But if more professional movie teams and creative writers could collaborate, we can surely expect more prosperity for the domestic science-fiction movie industry.